Built-in audio return channel for smooth sound. Up to 120 Hz refresh rate for a clear picture. Built-in Ethernet with 10.2 Gbps bandwidth speed. 24K Gold-plated connectors to minimize signal loss. 2-layer shielding restricts outside interference. 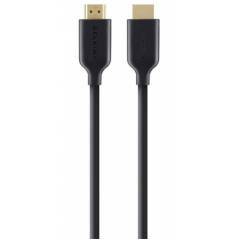 Belkin 5m Black HDMI Cable, F3Y021BT5M is a premium quality USB Data Cables from Belkin. Moglix is a well-known ecommerce platform for qualitative range of USB Data Cables. All Belkin 5m Black HDMI Cable, F3Y021BT5M are manufactured by using quality assured material and advanced techniques, which make them up to the standard in this highly challenging field. The materials utilized to manufacture Belkin 5m Black HDMI Cable, F3Y021BT5M, are sourced from the most reliable and official USB Data Cables vendors, chosen after performing detailed market surveys. Thus, Belkin products are widely acknowledged in the market for their high quality. We are dedicatedly involved in providing an excellent quality array of Belkin USB Data Cables.